I made this project because of the real lack of a good how to on the internet. Hopefully this finds its way into the right hands. Disclaimer: I take no responsibility for anyone's actions but my own. This blog is for informational purposes only. If you do anything illegal or foolish, bring harm to yourself or others with this information you are solely responsible. If you do not understand all of these directions(especially the part about wiring), do not attempt this project. You accept all of this or unconditionally agree not to attempt to recreate this project in any way or form. A vaporizer is a smoking accessory without the smoke. The concept is you heat what ever you would normally smoke to the point just before it starts to burn. This vaporizes the good stuff while leaving the rest. It is much easier on your lungs then normal smoking, with far less tar inhaled. 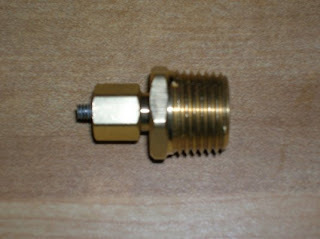 Grab the 3/4" to 1/4" Brass fitting. Unscrew the retaining sheath. Thread the screw threw the hole and tighten the nut in place. Screw the sheath back on. Unscrew the tip that came with the soldering iron and screw on your new bowl. Reverse the sheath until it directly contacts where the tip screws into the soldering. This will help it conduct heat. This was a very simple box, nothing fancy. It consists of five sides. I planned the holes on the top of the box to fit within the glass jar in the materials picture. At this point I cut the jar lid to the approximate size needed for the two brass fittings and the soldering iron. 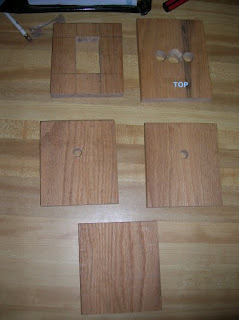 I then stenciled on to the top piece of wood where to drill the holes. For this I used the 3/4" drill bit. That size perfectly fit the two brass fittings, and using some files I was able to make the irregular size of the soldering fit also. I admit I did start over on the top once. 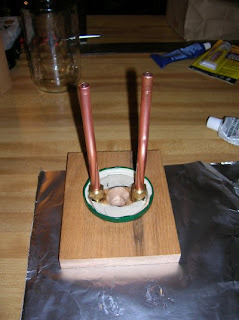 I assembled the copper tubes with their brass fittings and glued them in place vertically. I noted that it was very important to get the hex nuts on the brass fittings pointed the right way or the jar wouldn't fit properly. At this point I also glued the lid in place. Make sure it has a good seal all around. The dimmer switch side of the box I used math to center it(approximately). Then I drilled a couple starter holes and used the reciprocating saw to cut the rest. After this was done I attached the dimmer switch with a few wood screws. The sides with holes in them were made with a 3/8" drill bit. Although not shown in the pictures I did end up drilling a hole for the power cord. The box was assembled by pre-dilling holes for wood screws. Wood glue would have worked fine, but I didn't feel like waiting. You will now need to cut the cord on the soldering iron. Cut it about 5" from the base of the iron. This leaves a nice tail to plug in with later. Now glue the soldering iron in place. Only apply glue to plastic on the soldering iron. You do not want to inhale burning glue(if you're intelligent). Attach the top to the base of the box. I used glue for this. This part is rather easy. Before continuing, read all of the instructions that came with your dimmer switch, then modify your design accordingly. If you don't understand this part do not continue this project. The dimmer switch you bought hopefully came with 3x twist on wire caps. 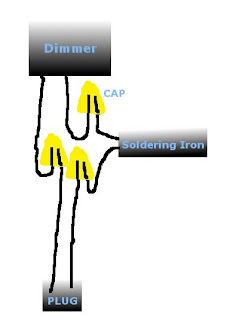 The wiring should look like the diagram. Connect one wire from the soldering iron to the dimmer switch, then connect the other wire (not the ground) from the switch to one of the wires on the cord you cut. Connect the other wire from the soldering iron to the other wire from the cord. You can ignore the ground unless your soldering iron actually has a ground. You should also tie a knot in the cord on both sides of the box so that it does not pull out from use. I suggest a figure of 8 knot. Let the glue dry(leave the jar off for this). Feed the plastic hose through the holes in the sides and stick them right into the brass fittings on the underside of the top of the box. I had to use a pair of tongs to do this because the box I made was rather small. If your hoses do not seal well wrap them in tape. 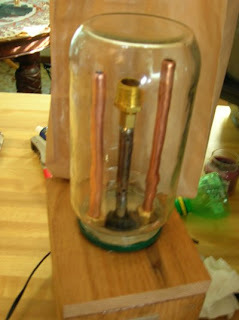 To the left is a close up of the tubes, heating element and jar. This is the final product. It is wise to let it heat up first without using it to make sure you are not getting anything noxious from the epoxy. To use simply plug it in. Set the dimmer to low. Put the smokable substance in the bowl. Tighten the jar into place and wait for it to warm up. You will probably need to turn up the dimmer to get it to vaporize. This all depends on how humid your smoking substance is. All in all this project cost me about 25$ not including the stuff I found around the garage, like the wood. If you don't have all the tools listed above I'm sure you could cobble together a less pretty version of this, but given a little creativity it shouldn't be too hard. You are not worried about the gasses produced heating brass and solder, then inhaling them?!? James, good comment re: brass. It doesn't look like any soldered points are being heated though. 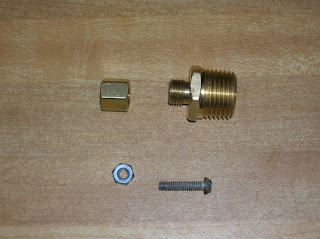 I wouldn't recommend using brass fittings. 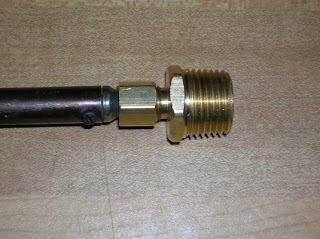 Brass contains zinc and when you heat it, it releases zinc oxide which is pretty bad for you. Copper fittings would be a better choice. They can also release toxic fumes, but at much higher temperatures, over 1000 Celsius. Zinc will do so at about half that temperature and your soldering iron could reach that temperature. Great post otherwise. Thanks Philly! keep posing this good stuff!! Following your plans for the build we made a couple changes, namely using a 1/2 inch copper pipe cap seated on the heating element into which the other (3/8 inch cap) could be placed and changed out easily. I hear the concerns but the dimmer will keep the soldering iron at 180c max, anymore and your gonna fry your weed. Super cool man and awsome guide!... Im gonna knock one up for sure, will report back! 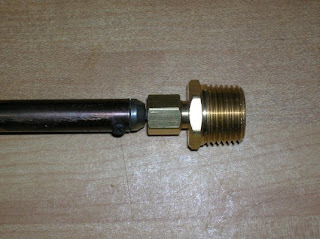 Nice blog, vaporizers are the great thing for the smokers and you did very well explanation of How To Make Teh Vaporizer. This is probably a dumb question, but why are there two hoses? Is it so two people can smoke at the same time, like a hooka? Or do you use one hose to smoke and the other to control airflow, like a bong? Thank you very much for sharing this with us, i hope i will be able to make it correct. And for sure it will save my money as well. It is so amazing to have into knowledge that the most harmful thing can also be converted into useful just by changing the source of that. The herbal vaporizer vaporize tobacco rather than smoking it and therefore provides the one with the feel and flavors of smoking without any harm as it heats the substance rather than burning which reduces its bad effects to nil. nice post but although it is very true that vaporizer is very effective and less harmful but should be heated in suitable metal container and at suitable temperature so that it doesn't produce toxic substance and harm the user. It seems very easy to me and if i will try it two three times , i am sure i will be able to make it easily. Thank you very much for sharing this knowledge with us. There are so many vaporizers for sale but making it at home is a different experience. Oh good to see the important post here. Vaporizers are Perfect solution for respiratory problems it is also vary usefull in treatment of asthma. Healthgenie.in Provides wide range of health devices,health products,supplements online, International Brands LIke Equinox,Bremed,HeuerOmron,Met RX,Ultimate NUtrition,Optimum Nutrition,Natures Bounty and many more.here you can also ask professionals that which Brands Suits your Body. I think you shared such a nice post with us. 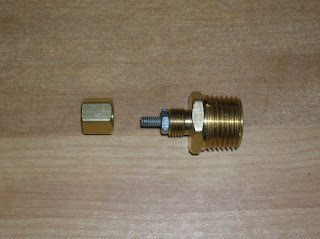 Anyone have any links to somewhere online to buy the 3/4" to 1/4" fitting? It was really impressive creation. I am confusing how the capacity of this vaporizer. I have also searched the volcano vaproizer one in the web on my way of exploration. Great article! Very interesting... What kind of gasses would be emitted from this device? 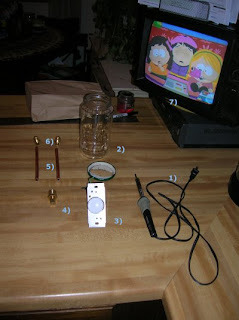 Wow thats really very easy way to make vaporizers at home. 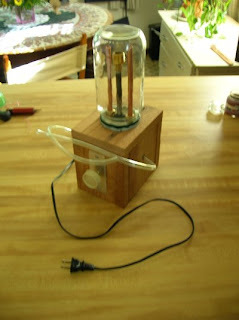 Cool way to make vaporizers device thanks for posting this. Quite interesting and different post.. Keep posting..Stay blessed!! Problems with Vape box and tank.? Bitvape offers Vaporizer, Vaporiser and vaping. now you can buy ecig, e-cigs, vape, dry herb vape, Vape Kit and the best electronic cigarettes. thnx for sharing online headshop nice vaponizer.. This blog have a very nice detail about the vaporisers and i really appreciate it,good work. If someone want to know more about the vapor king I think this is the right place for you! If someone want to know more about the vaporizer I think this is the right place for you! If someone want to know more about the marijuana vaporizers for sale I think this is the right place for you! Did you already read this Pax 3 Review ? Such a nice blog and very nice you work and sharing this wonderful article about the atomizers nice style of working. Vape Density is high-quality online vaping supplies Store in USA. We offer e-liquids, E-juice, vape kit, vape mods, nicotine salts, vaporizers and vaping accessories at comfortable prices.